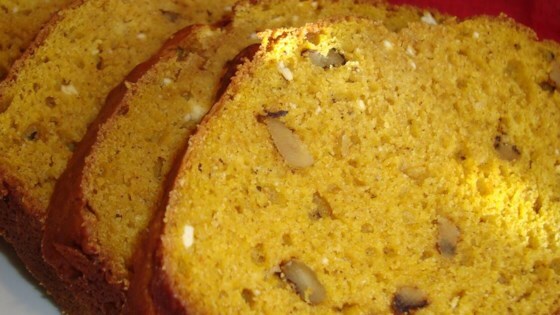 "A quick and easy quick bread to make. Very moist and tasty as well." In a large mixing bowl, cream together sugar, cream cheese and margarine. Add the eggs, one at a time, mixing well after each addition. Blend in pumpkin; mixing until completely incorporated. Combine the flour, baking soda, salt, cinnamon, baking powder and cloves. Mix the dry ingredients into the pumpkin mixture; stirring just until moistened. Fold in the walnuts. Divide the batter evenly between the two pans. Bake at 350 degrees F (175 degrees C) for 60 minutes, or until a toothpick inserted into the center of a loaf comes out clean. Let cool in the pans for 5 minutes then remove from pans to cool completely on a wire rack. It turned out fine - I will probably make it again and add walnuts next time. loved this recipe! instead of walnuts, I used chocolate chips instead! This is a fantastic recipe. It yielded 3 loafs. I used homemade pumpkin and the cream cheese makes for a nice texture and added taste.